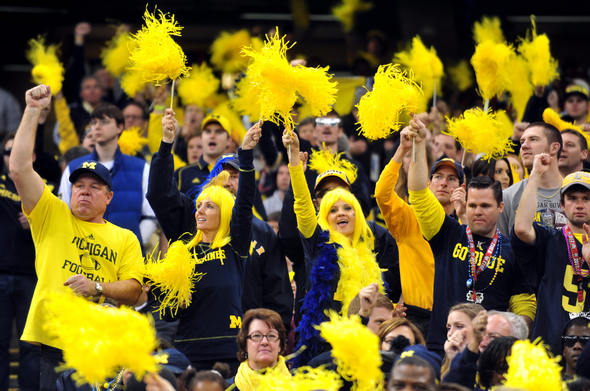 Posted on Tue, Jan 10, 2012 : 11:10 a.m.
Michigan fans cheer at the Sugar Bowl. So, was Michigan a top-10 football team this year? This is college football. So, naturally, pollsters disagree, even after 13 games. The Wolverines finished No. 9 in the USA Today coaches poll and No. 12 in the Associated Press poll. They went 11-2 and captured a Sugar Bowl title, but they also played a relatively soft schedule and eight home games, which likely held them back. Interestingly, the Wolverines finished one spot ahead of rival Michigan State in the coaches poll. They lost to the Spartans 28-14 this year. The two also finished consecutively in the AP poll, but were transposed, with Michigan State one spot ahead of the Wolverines at No. 11. This is Michigan's best finish in either poll since the 2006 season, when it fell to No. 8 in the AP poll and No. 9 in the coaches poll after a Rose Bowl loss. It had an identical 11-2 record that year. Wed, Jan 11, 2012 : 11:29 p.m. Wed, Jan 11, 2012 : 10:04 p.m. I agree with many posters that MSU beat Michigan and are a overall beter team LASTyear. It's up to the UM team to assure that they are the best THIS year. Wed, Jan 11, 2012 : 9:04 p.m. Wed, Jan 11, 2012 : 5:33 p.m.
missionbrazil, the day I regard the BCS rankings as factual or absolute is the day I give up thinking for myself. Their methods are flawed, and can be influenced by several factors besides which teams are statistically better than others. The fact that Michigan wound up just high enough in their rankings to qualify for a BCS bowl, and were then selected for that bowl over better teams, speaks volumes for the failure of the system. Wed, Jan 11, 2012 : 4:20 p.m. They beat us so they're better than we are. But, next year without their classy and outstanding quarterback, Cousins, they will go down. Wed, Jan 11, 2012 : 10:03 p.m.
Winning a game at home early in the season is no indicator of being the better team. It's one game. One game can be decided on a fluke. Does a fluke make one team better than the other? I wish this specious argument could be dropped. Wed, Jan 11, 2012 : 12:57 p.m.
C'mon, be real. Separate being a fan from reality. Reality is we may not even be a Top 20 team. We played a soft schedule and all our big wins came against teams that lost (and looked bad) in bowl games. Brady Hoke and staff got all they could out of this team. It was a fantastic, magical season and Brady Hoke and Greg Mattison both deserve to be coaches of the year. BTW, here was my prediction from last summer, not bad, huh? : Commented on &quot;One magazine's prediction: Michigan football team will sweep its nonconference opponents&quot; 7/9/2011 2:00 PM 8-4? No way. Assuming our defensive backfield does not get demolished by injuries like last year, we go 10-2 with a bowl loss unless we get lucky on the draw. The Big 10 is not that powerful, we don't have to be great to win, just solid. Wed, Jan 11, 2012 : 3:57 p.m.
You were right on with your prediction. However, Michigan football fans never accept realty. Wed, Jan 11, 2012 : 12:05 p.m. I'm a sick of the MSU-UofM comparison and bashing going on, both teams had great seasons, we all have our own favored team. Both teams are deserving and recieving Natinal recognition. I'm looking forward to following and rooting for both programs again next season. Wed, Jan 11, 2012 : 3:11 a.m. The BCS is messed up. In some polls, VT finished in front of us. All though we didn't play our best, we do deserve to be a top 10 team. Wed, Jan 11, 2012 : 1:42 a.m.
Mich struggled against a very weak, second place team (VT) from a second rate conference (ACC). The top ACC team (Clemson) was humiliated by Big East powerhouse(WV, tongue in cheek)) who could have laid a 100 points on them if they wanted to. Clemson in turn beat VT twice this season, and punked them in the conference championship. State convinced me they are the better team because they a beat a strong, physical SEC team (GA) in their own backyard. Mich has nothing to be ashamed of this season, considering where they were under RR. Wed, Jan 11, 2012 : 1:29 a.m.
Head to head makes sense.. MSU beats Northwestern (so NW is out) Nebraska beats MSU (so MSU is out) Mich beats Nebraska (Neb is out) Iowa beats Mich (Mich is out) Minnesota beats Iowa (Iowa out) So Minnesota is number one head to head right? Wed, Jan 11, 2012 : 12:14 a.m.
As a number of posters note, Michigan State beat us. That means that this year, they were the better team. I hope we beat them next season, but, well, may the best team win. Good show this year, Spartans! Just because MSU beat Michigan, does not mean they were the better team, only the matched up better against us. If they were a better team, then they would have beat Nebraska and ND. Michigan and Michigan state were both good teams and made the fans in Michigan (and around the world) proud - lets just leave it at that! Wed, Jan 11, 2012 : 12:07 a.m. RIDICULOUS STORY HEADLINE - Why can't some Michigan fans justify their football season accomplishments without constantly mentioning Michigan State? &quot;Big Brother&quot; is so worried about the Spartans that they have to talk about them during any mention of Michigan Football. The jealousy is more prominent than the famed winged helmet. Competing since 1879 - Michigan has the most all-time wins and the highest winning percentage in college football history. Think about this and build some self esteem. True State of Michigan fans should be happy for both programs. Both had great seasons! Wed, Jan 11, 2012 : 1:09 p.m. Try to have some fun with this and not take it too seriously. Aren't stories like this supposed to be about fun, mindless arguing? I agree, though, both teams have a lot to be proud of. We were the few shining stars in the Big Ten bowl season and two-thirds of the 11 win teams of this year's Big Ten. Throw in Western Michigan's great year and the return of Eastern Michigan, and the state of Michigan held it's own in the world of college football! Wed, Jan 11, 2012 : 6:31 a.m.
Gimme a break. The two teams are instate rivals, and will always be compared. You yourself obviously have an interest in UM football since your commenting on AA.com. Jealousy? History goes further than the last 4 years, and UM owns Sparty. Why would UM need to be jealous? Congrats to Sparty for being relevant again, hopefully they can stay there for once. Why is it that MSU fans come on to a Ann Arbor website and say we are obsessed over our &quot;little brother?&quot; You are commenting on a Michigan website, can you not see the irony in that comment Sparty? Go Blue! Wed, Jan 11, 2012 : 4:06 p.m.
You make a good point JS. The site may be an AA site, but the comments are in the Michigan Football section, so this section is a Michigan site. Wed, Jan 11, 2012 : 1:04 p.m. I am a Michigan fan, but this comment is just silly. This is not a Michigan website. It is an Ann Arbor website. Maybe, just maybe, a few MSU graduates or fans live in Ann Arbor. If the MSU folks want to post here, why not? Then we can ridicule them before a receptive audience. There is a great Michigan website (MGoBoard) at mgoblog.com. Wed, Jan 11, 2012 : 4:49 a.m. Some MSU graduates actually live in Ann Arbor, ironically. Tue, Jan 10, 2012 : 11:04 p.m.
What difference does it make where either team is ranked? They both had solid seasons and I think most would agree they are legit top 20 programs this year. If your not ranked 1 or 2 and if you did not win your conference then what difference does 9-13 make?? Tue, Jan 10, 2012 : 9:57 p.m.
Tue, Jan 10, 2012 : 8:41 p.m.
Michigan loses 4 years in a row to Michigan State including this year. Not sure why there is any question? Not sure why they (Michigan) were even top 15? Soft early schedules define both the football and basketball programs at U of M.
Wed, Jan 11, 2012 : 12:09 a.m.
Grow up. read the article before commenting then you would understand it has nothing to do with past years. And States schedule was as weak as U of M.
Tue, Jan 10, 2012 : 9:37 p.m.
Also, in regards to this article, what happened last year and the two years before are irrelavant. The article was specific to this season. Tue, Jan 10, 2012 : 9 p.m.
Yeah, those early MSU games against Youngstown State, Florida Atlantic, and Central Michigan were brutal. The only tough thing about MSU's early games was the beatdown that ND put on them 31-13. Tue, Jan 10, 2012 : 8:38 p.m.
At this stage, the final polls don't really matter much at all. The only thing remembered is that Alabama is #1. Who cares if UM was ranked higher or MSU, we're not talking #1 or 2, we're talking 9th, 10th, 11th, whatever...SO WHAT!!! Neither won the BT nor the NC. Although I hate to say it, regardless of the final polls, MSU will have bragging rights this year. We beat ND &amp; Neb, ND &amp; Neb beat MSU, that's really not a gauge as to who's better because teams match up differently from 1 team to the next, but on record State beat UM, they were the better team that day...nothing else matters! Me personally, I would rather have the victory over State than the final ranking. Who was better at the end of the season? That's what the polls are about. Yes, msu won when the two teams played in October in East Lansing, but since then, who has played better? UM beat two of the teams that clobbered msu, and the final BCS rankings say UM had the better season. Tue, Jan 10, 2012 : 7:43 p.m. Both 12 and 9 are higher than I expected at the start of the season. It was a great comeback year for the team and its first-year coach. Kudos all around. If Denard can figure out how to stay calm in the pocket and throw accurate downfield passes (something Jefferson couldn't do last night for LSU), we have a solid change to beat an Alabama team that stands to lose up to seven starters on defense, plus 5ish on offense. When Denard was good this year, our offense was great. When he wasn't we lost or struggled to victory. Bottom line: We can't let teams put 10 defenders within five yards of the ball, and then run up the middle (I counted this at least once during the Sugar Bowl). That's not a play-calling problem, it's an execution problem. LSU couldn't win last night in this situation, and neither can we. Go Blue! Wed, Jan 11, 2012 : 6:20 p.m. The &quot;Ifs&quot; are entirely dependant on the pass protection DR gets. A new center will definitely have to step up this year. If there's one thing &quot;bama&quot; demonstrated this year, they have no problem reloading. I guess that's why someone had them #3 in the &quot;it's too early&quot; poll. You could easily make the argument that we had the better season and should be ranked higher at the end of the season. * MSU had 3 losses, we had only 2 * Our 11-2 record is better than 11-3 * MSU lost to 2 teams that we beat, ND and Nebraska * The lost badly to the 2 teams that we beat (ND 31-13 and Nebraska 24-3) * Before the bowl games we were ranked higher than MSU (we were # 13, MSU was # 17) * We beat a higher ranked team (Va. Tech 11-2 # 11) than MSU did (Georgia 10-3 # 16) Either way, we had a great turnaround season, and the MSU win streak will be over soon. Go Blue ! Wed, Jan 11, 2012 : 5:34 p.m. Wed, Jan 11, 2012 : 4:01 p.m.
SMC, using your argument, LSU deserves to be national champions and not Bama, because Bama did not play in the SEC championship game. Not only did LSU play in the SEC title game, they won it, so they have more of an argument than MSU. Except that LSU is NOT the national champs, because they lost Monday night ... they lost their extra game, and it cost them, just as it should. MSU lost their extra game, and it cost them. Also, if UM was # 13 and MSU was # 17 in the BCS before the bowl games, how can you say that MSU should finish higher after the bowl games ... especially when you consider that we beat a higher ranked team in the bowl game than MSU did. There is no way MSU, who was 4 spots below UM before the bowl games, should jump higher after beating a lower ranked team than UM. That makes no sense. Wed, Jan 11, 2012 : 1:21 p.m. Wed, Jan 11, 2012 : 3:47 a.m. So basically, RudeJude, you're saying that Michigan had a better season, because they had a worse conference record than MSU, and didn't win their division? That makes no sense. Put another way: If Michigan had also played 14 games this season, and one of those games was against Wisconsin, the records would be identical at 11-3. The loss to Nebraska was at the tail end of a string of tough opponents, and as far as the ND game, I'll side with the late Coach Bo, who said that the Big Ten games are all that matters. Tue, Jan 10, 2012 : 10 p.m.
SMC: &quot;MSU's record reflects the fact that they won their division, earning a spot in the championship game. If not for that, the records would be identical.&quot; But there is no if not, there only is, and they lost, and it became part of their record, which affected their rank and bowl placement. &quot;If not&quot; doesn't matter. &quot;Michigan barely beat ND, and barely won the Sugar Bowl&quot; They won these game, no matter how close the margin. I definitely Michigan State was the better team between the two, but did they have a better season? I think Michigan had a better record and a stronger finish. It's just my opinion, but I think that counts most of all, but it's all opinion. Better team, Michigan State, better season, Michigan. Tue, Jan 10, 2012 : 9:52 p.m. It's not much of an argument, considering: *MSU's record reflects the fact that they won their division, earning a spot in the championship game. If not for that, the records would be identical. *The transitive property does not apply to sports, and even if it did, MSU still beat Michigan head-to-head. *Michigan barely beat ND, and barely won the Sugar Bowl *BCS rankings put too much weight on losses, which makes no sense if one team played an extra game by virtue of winning their division. This also applies when comparing VT to Georgia. *Michigan's record is partially the result of having an easier schedule, where they didn't have to play Wisconsin. Twice. *Oh, did I mention that Michigan lost to MSU by two touchdowns? That pretty much settles that. Tue, Jan 10, 2012 : 9:07 p.m. I do have an allegence with either team, but talk about childishness. Michgan should have played Georgia, and likely lost. In any case, I do not think either team could have handle a good number of SEC. Tue, Jan 10, 2012 : 7:21 p.m.
Tue, Jan 10, 2012 : 6:30 p.m. Wed, Jan 11, 2012 : 9:49 p.m. So read the Lansing paper. It's got a lot of crap about M-shoe. Wed, Jan 11, 2012 : 5:32 p.m. I live in Ann Arbor, so I read what passes for local news. Tell annarbor.com to cover more MSU news, and I'll stop commenting on the UofM stuff. Deal? Wed, Jan 11, 2012 : 12:11 a.m.
maybe you should stick to Lansing webpages if you are worried about obsessed people. You are one for being here. Tue, Jan 10, 2012 : 6:02 p.m. Wed, Jan 11, 2012 : 3:09 p.m.
WHAT? There are other college sports than Football? Sorry, but I don't believe you! I live for Football at Michigan!!!!! Tue, Jan 10, 2012 : 10:57 p.m.
Tue, Jan 10, 2012 : 6 p.m. I've always figured the AP poll to be (relatively speaking) more credible because these are sports writers who pay attention to more games nationally. Unless they are homers like the people who have still voted LSU #1 or Oklahoma State #1. How do coaches have the time to study other teams they don't play? Or even sports informtion directors for that matter. I think perhaps they allow other people within the football or athletic departments (possibly even interns) to make the picks. At this point who knows or cares anyway? I'd like to see a 16 team playoff but I know the logistics would be almost impossible. Now we enter the &quot;my team will be better than your team next year because we're getting higher rated recruits&quot; phase of the football year. Of course a three or four or five star recruit's rating is based on some &quot;experts&quot; opinions. Then we have some people who say our team was better than your team this year even though you beat us on the field. I'm still trying to figure out the logic in that. Tue, Jan 10, 2012 : 7:59 p.m.
Bob, I agree 100% with your sentiment: &quot;How do coaches have the time to study other teams they don't play?&quot; I've always placed much more stock in the AP polls. During the season, there is no way these coaches have time to adequately review all the other teams. After the season, all the coaches (should) have time to do is finalize their recruiting. Ill bet all the coaches voting do is to tweak the AP polls from the prior week! Tue, Jan 10, 2012 : 5:56 p.m.
MSU is clearly better than Michigan on the field, unless you are talking about dirty play, then MSU is better....oh wait, I guess they are better in both catagories! Tue, Jan 10, 2012 : 5:46 p.m. The main point to rememeber is the improvement the team made this year. Finishing #9 or #12 is pretty good no matter what. Next year might even be a bigger challenge with Alabama on the schedule to start off the season, but with a good recruiting year shaping up, the future looks bright for U-M over the next few years. The key will be replacing keys starters from the defensive and offensive lines. Note: I sure hope Khoury and Denard get the snap down pat before next season starts, lol. Tue, Jan 10, 2012 : 5:57 p.m. I discount the troubles Khoury had with the snaps. Molk only got injured pregame, Khoury never expected to play, certainly did not take many snaps with Denard in practices. I have no doubt that they will get their timing down before the Alabama game. Tue, Jan 10, 2012 : 5:34 p.m.
MSU fielded the better squad this year. They beat an SEC team in a bowl, coming from behind. We beat Va Tech. We played better than MSU at times, but overall, they did a better job. I'm looking forward to next year. Go Blue! Tue, Jan 10, 2012 : 5:33 p.m.
Alabama lost to LSU in an earlier head to head matchup and what did that mean? Apparently nothing. An argument can be made that at the end of the season, Michigan may have been better than Michigan State. At any rate, the controversy makes the UM/MSU game next year that much more exciting. Tue, Jan 10, 2012 : 5:24 p.m. I have no prob if one of the polls think that the Sparties are better this year, but head to head is not the gauge in the polls, it is the total body of work. Head to head means that ND should be ranked more than MSU even if ND has 5 losses. At the end of the season, it is the total body of work of the whole season. Tue, Jan 10, 2012 : 5:21 p.m. I think we had a great year! We showed a lot of improvement as the season progressed, sure we lost to MSU and IOWA, but we had an exciting season. Hopeful/excited for next year! Great season BLUE! P.S. If you put your ear to the ground, you will be able to her the msu trolls coming. For today, good-bye, for tomorrow good luck, FOREVER GO BLUE! Tue, Jan 10, 2012 : 5:16 p.m.
Tue, Jan 10, 2012 : 5 p.m. The Coaches Poll is the USA-Today poll which has a lot of merit. Since it is a split poll, you can pick either way. neither Michigan or MSU had a convincing Bowl victory, a win for both. Wisconsin doesn't belong in the mix because they lost their bowl game more convincingly. The college football season is over and Michigan came a long way to be ranked amongst the MSUs and Wisconins of the Big 10. I'll settle for the split. Surely, some of the Sparty fans can see the delight in being ranked higher in the AP Poll. No big deal bcause Michigan will have a much better recruiting class. The future is brighter for the Maize and Blue. This 11 and 2 season is better than 2006 because Michigan lost the last two games (ohio and then TX) whereas, there's a 4 game winning streak to end this season. Tue, Jan 10, 2012 : 9:04 p.m.
the 04 team played texas. technically we didnt play in a bowl game in 06. the 06 team lost to usc in the rose bowl. Tue, Jan 10, 2012 : 4:50 p.m.
We played head to head and lost. They made it to the big ten championship game and we didn't. We both won our bowl games. If there are true &quot;Michigan men&quot; and &quot;Michigan values&quot; then we should live in in reality. MSU was better this year. Besides, there is always next year and we don't have a &quot;buff' guy in a skirt as a mascot. We're still Michigan. Go Blue 2012! Tue, Jan 10, 2012 : 5:43 p.m. Right. Your mascot is a giant weasel. 'Nuff said. Tue, Jan 10, 2012 : 4:27 p.m.
We played head-to-head and lost. Enough said. You could argue whether we had a better SEASON than the Spartans, but they beat us. Better teams are decided on overall season performance. One game? Means little. Be serious. Wed, Jan 11, 2012 : 1:01 p.m. Wed, Jan 11, 2012 : 12:08 a.m. The polls are based on ONE thing and ONE thing only. The opinion of that team on that specific day. It works the same way in EVERY major sport. The Texas Rangers lost more games to the Detroit Tigers through the regular season, BUT that did not get the Tigers anything. It did not translate into home field, or get them passed them in the playoffs. MSU lost to Wisconsin, Notre Dame and Nebraska. You can argue MSU beat UM (at MSU by the way), but then UM beat ND and Nebraska. I would also say UM beat a better team in their bowl game. Georgia was maybe the 5th best team in the SEC. If head to head is enough said, why isn't Notre Dame ahead of MSU? Why isn't Nebraska ahead of MSU? Tue, Jan 10, 2012 : 10:41 p.m.
Head to head.. MSU beats Northwestern (so NW is out) Nebraska beats MSU (so MSU is out) Mich beats Nebraska (Neb is out) Iowa beats Mich (Mich is out) Minnesota beats Iowa (Iowa out) So Minnesota is number one head to head right? Tue, Jan 10, 2012 : 9:34 p.m.
Tue, Jan 10, 2012 : 7:13 p.m. Enough said? With your analogy Alabama wouldn't be national champs. Tue, Jan 10, 2012 : 4:17 p.m.
&quot;This is Michigan's best finish in either poll since the 2066 season&quot; 2066? That would be team number 187? Wed, Jan 11, 2012 : 12:54 p.m.
Aren't you clever. Let us know when someone hires you to write and then we can critique your spelling.